Since sine is not a one-to-one function, the domain must be limited to -pi/2 to pi/2, which is called the restricted sine function. 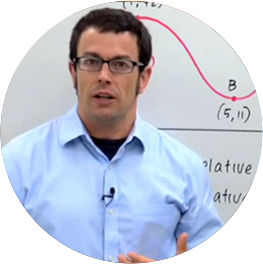 The inverse sine function is written as sin^-1(x) or arcsin(x). Inverse functions swap x- and y-values, so the range of inverse sine is -pi/2 to /2 and the domain is -1 to 1. When evaluating problems, use identities or start from the inside function. 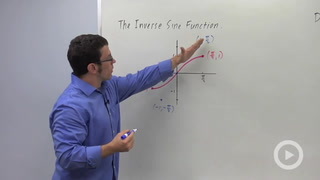 I want to talk about the inverse sine function, but before I do I need to review a little bit about inverse functions and give you an example f of x equals x squared has no inverse. Here's a graph of f of x equals x squared it doesn't have an inverse because it's not 1 to 1 and remember the test for 1 to 1 is the horizontal line test. If a horizontal line passes through more than 1 point on the graph of a function it's not invertible but we can make it invertible by restricting the domain and the way we do that is we just take a piece of it that is 1 to 1 like the right hand piece. So let's focus on this piece here and I'll call it g of x and it's x squared for x greater than or equal to 0. So this domain restriction makes this function 1 to 1 and now we can invert it. And it's inverse would be g inverse of x equals root x, so this idea, the idea of domain restriction to make the function 1 to 1 is how we make the trig functions invertible and how we get that inverse trig functions. Let's take a look at sine. Sine is very much not 1 to 1 it's got infinitely many of these waves in it so you cannot invert the sine function as this. You've got to restrict the domain and so we restrict it to between negative pi over 2 and pi over 2. That piece is 1 to 1 and let's call that function f of x equals sine x for x between negative pi over 2 and pi over 2. This is called the restricted sine function, and it is important to remember that the inverse sine function that I'm about to write down is the inverse of this, the inverse, I'm sorry the restricted sine function, restricted sine funtion, so again that's this little red piece here. The inverse of this function is written inverse sine, this negative 1 superscript is not an exponent neither here nor here it's actually a symbol for the inverse of the function sine so make sure you remember that. It's sometimes written this way and sometimes it's also written this way arc sine, so those are 2 names for the inverse of this function. Now one thing to remember if the domain of the original function is between minus pi over 2 and pi over 2, the range of the inverse sine is going to be between negative pi over 2 and pi over 2. So I'll write that down here negative pi over 2 is less than or equal to I'll call it y is less than or equal to pi over 2. The range of the sine function is between negative 1 and 1, the domain of the inverse sine function will be between negative 1 and 1 sorry that's domain. So whenever you invert a function the range and domain switch again most important thing to remember about the inverse trig functions is that we first have to restrict the domain and make the function 1 to 1 in order to make them invertible.